I've been asked a couple times about how it stacks up against the venerable K&M Match Case. I've often wondered the same and had never owned one of the K&Ms until recently. I picked up one of their brass versions, the long type. It arrived with a couple spare o-rings, an extra cord, and a small brochure on the use and care of the match case. They offer a 'Real Simple' guarantee. Each matchcase to be waterproof to 2000psi, they guarantee total satisfaction, a replacement or a refund, your choice. 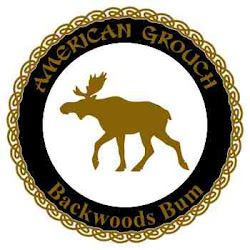 I believe them on their guarantee, the workmanship is topnotch, much like their reputation. It seems that anyone who has ever owned either an original Marble's or Boy Scout matchcase (both highly collectable today) or modern copies of either (mostly junk) relates to the difficult to nearly impossible process of opening the case with cold and/or wet fingers or when a piece of sand or grit becomes lodged in the threads. Because of the thin-ness of the case wall, the shallow knurl (diamond pattern impressed into the case wall) on all older cases serves more for decoration than any practical function. 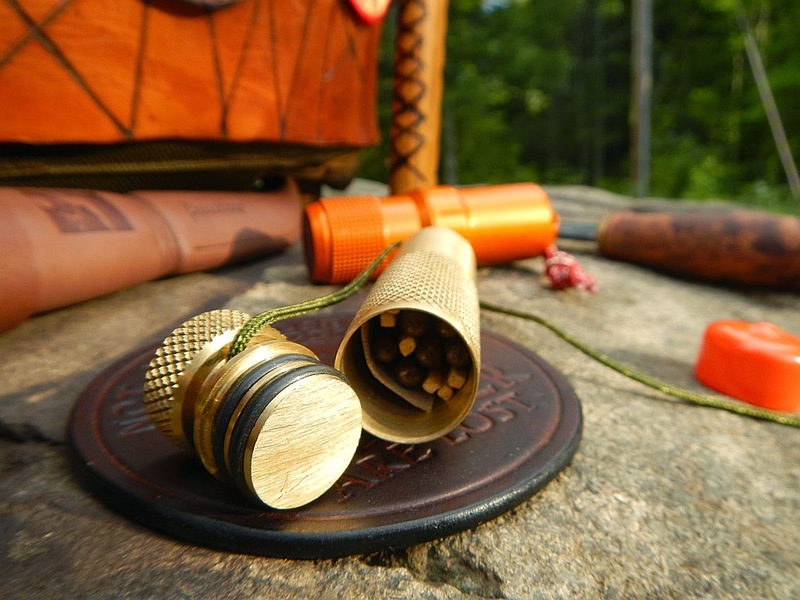 Many of those old cases found at outdoor and survivalist shows exhibit signs of being clamped and opened with devices ranging from vices and pliers to teeth and we can only guess what else. (PS - they also leak!) Based on personal experience with all of the above, the K&M matchcase was designed on purpose to open and close and to seal without threads from the first prototype right up to the present models. From day one simplicity and reliability have been the name of the game. 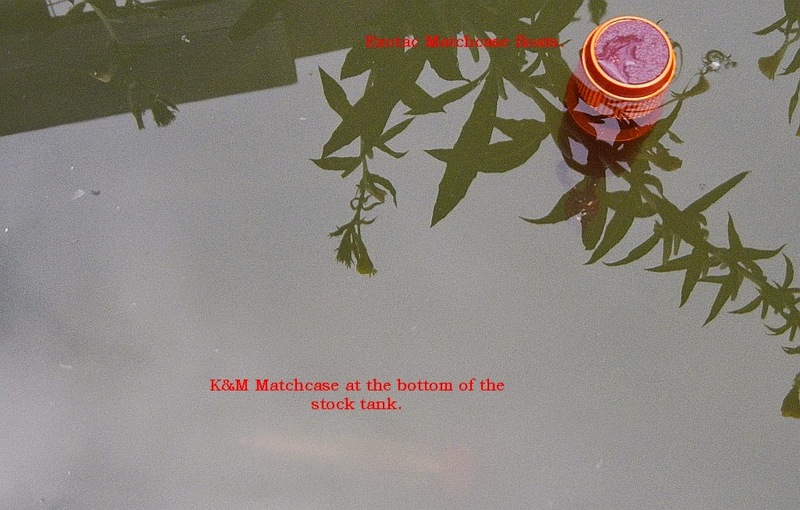 The K&M design is to directly deal with the problems of those old matchcases referenced in the quote above. As a result the cap/plug is double o-ringed and relies on a combination of pressure and the cord being tight to keep the cap in place. 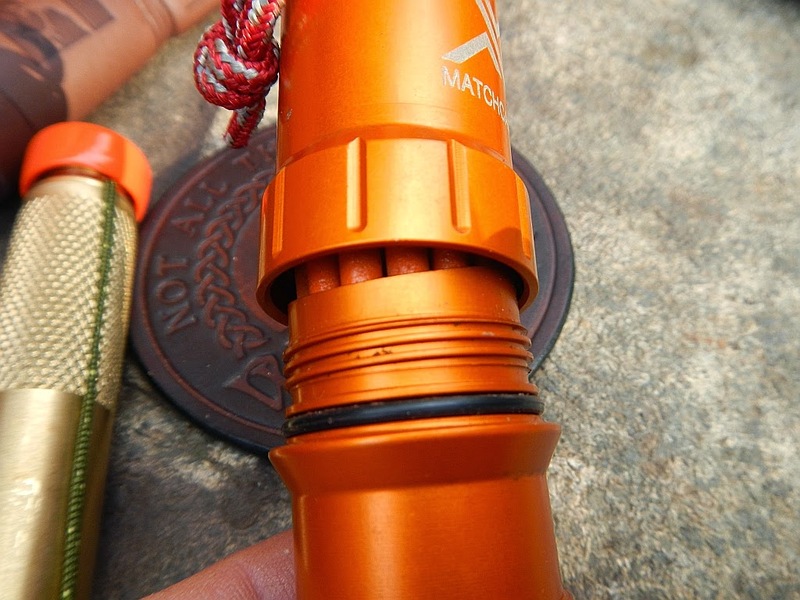 The Exotac is a threaded cap and utilized a single o-ring design. I've carried this one specifically for close to two years and have not had to replace the o-ring nor have I had any difficulty in opening the case. I've had trouble with the old Marble and BSA types though so the issue the K&M wanted to design a solution for was real, with the old cases. The Exotac doesn't suffer this problem for a couple reasons. The threads are open enough not to get jammed up, the diameter and the knurled base give plenty of purchase when twisting the cap off, not that I've had to use much force to accomplish the task. 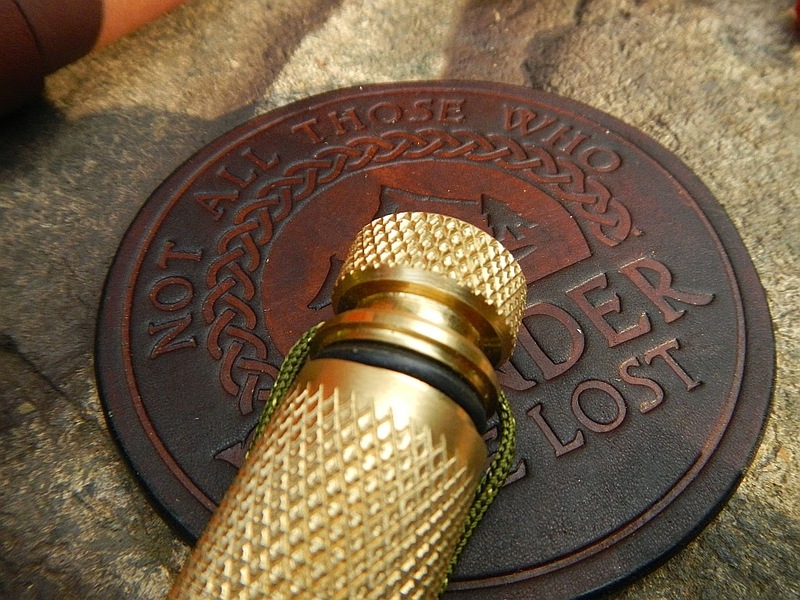 The other primary difference and one of the handy things about the K&M is the compass built into the cap. 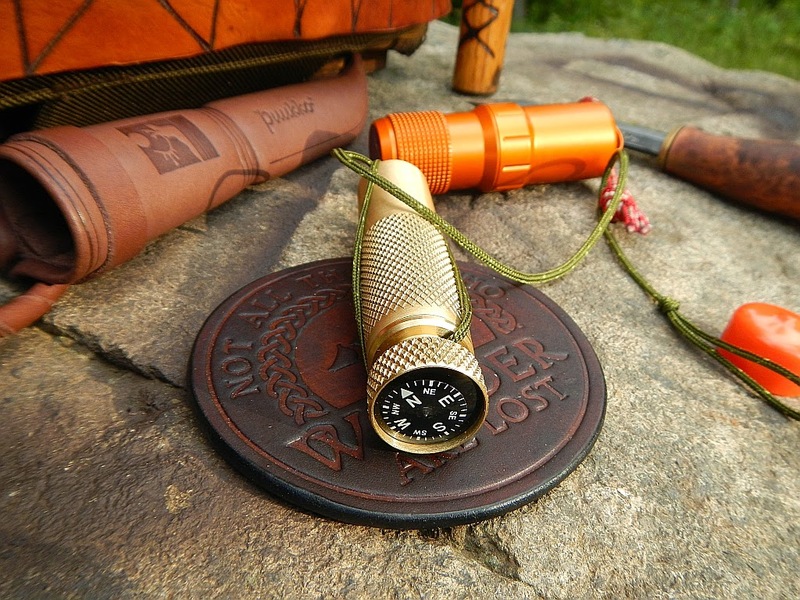 It is a quality compass and calibrated true with my K&R Alpin as well as my Cammenga. 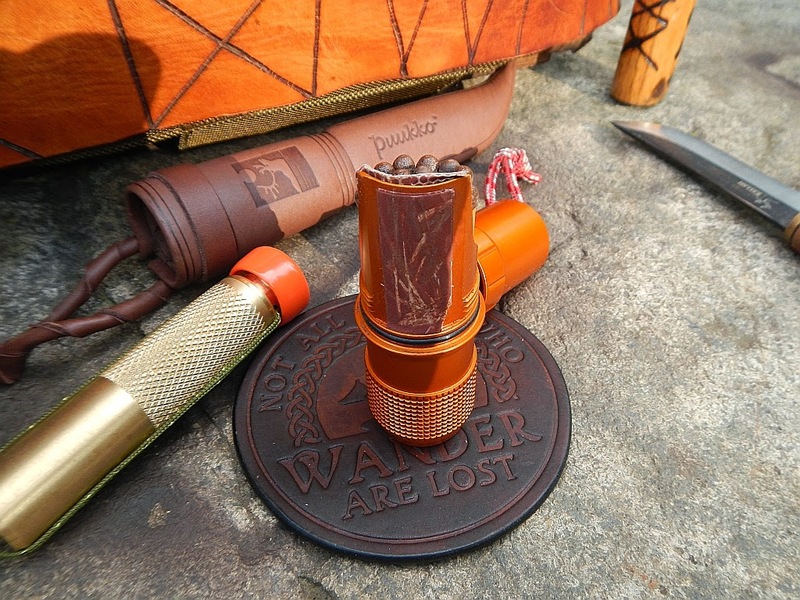 The orange cap on the case serves to protect the compass. 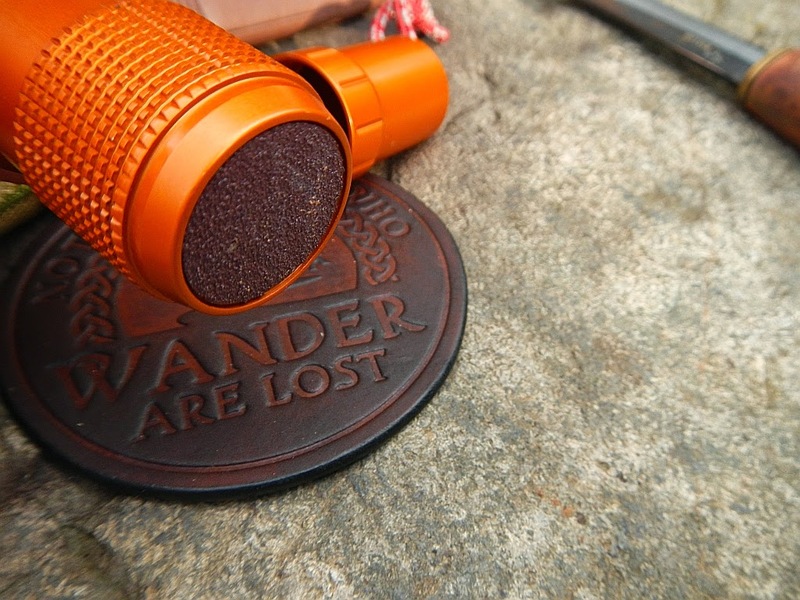 If you're already carrying a compass it never hurts to have a back up, if you're already carrying a back up, well it's either redundant or a back up to a back up! As I was comparing the two I tossed them into a mud puddle to test the waterproof claims. I left them in the water for twenty minutes and retrieved them. Opened both and fount the contents completely dry in each. 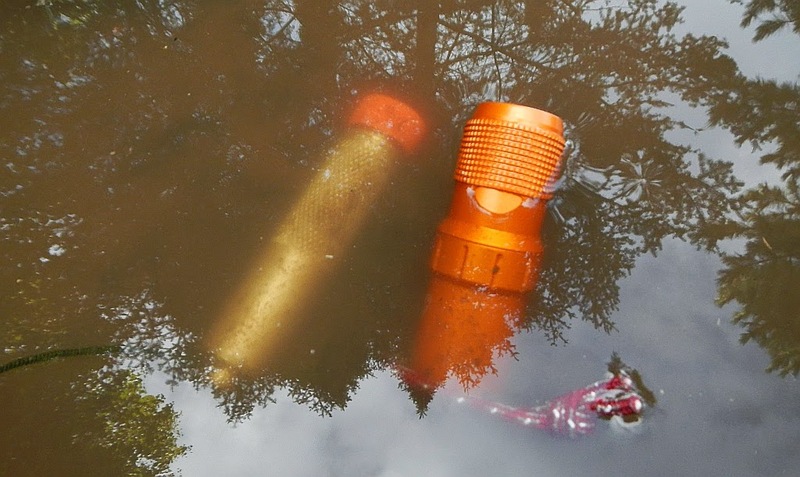 I noted the fact that the Exotac floated up on one end with the other resting on the bottom of the puddle. I wanted to get them both in deeper water, both as another waterproof test but also to further explore the floating of the Exotac. The closest thing to hand that constituted deeper water was my stock tank with two feet of water. A little difficult to make out the location of the K&M, it went to the bottom quickly. 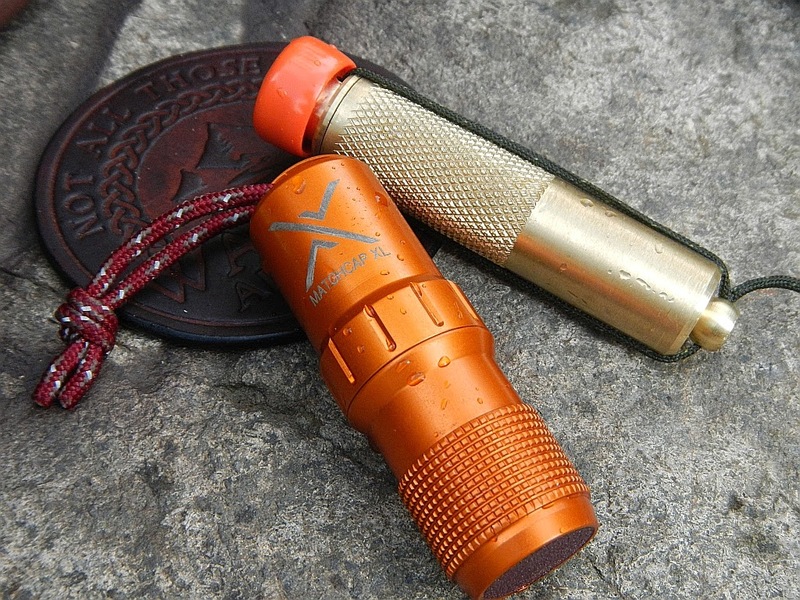 Again the Exotac floated striker end up meaning the threaded cap and 98% of the rest of the case were submerged. The matches I am using are the UCO Stormproof, these I have found, are great matches and live up to their hype. Can't blow them out, burn when wet, even under water. The K&M would hold 13 maybe 14 while the Exotac held 19 or 20. The K&M doesn't have a strike surface suitable for this type of match so I cut a strike card and placed it faced away from the matches inside the case. 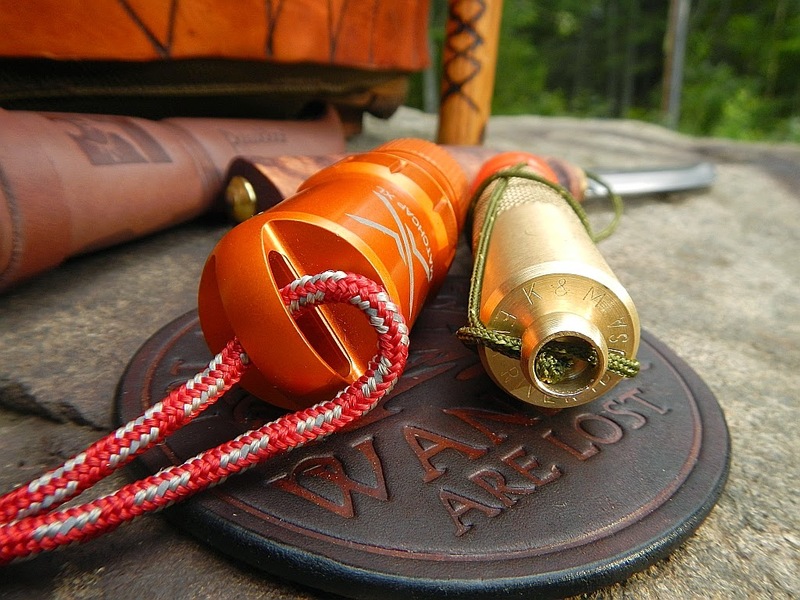 The Exotac does have two strike locations, one coarse and one fine. The coarse is on the bottom and the fine is located on the back wall but protected inside the cap when the cap is on. Even so I still cut a strike card and keep it inside the case. 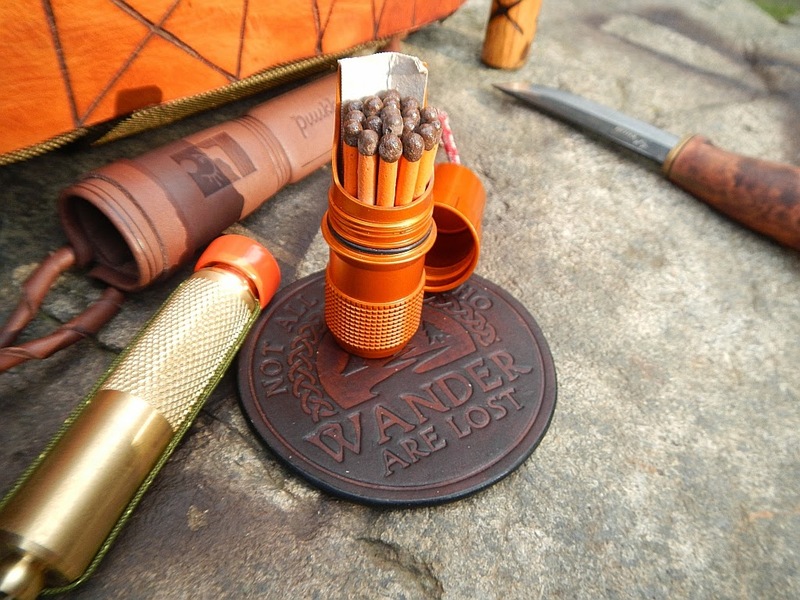 If you're carrying strike anywhere matches you don't need the strike surfaces of course. I didn't bother with comparing the two from a weight perspective, obviously the K&M brass unit is heavier than the machined aluminum but I'm not counting ounces, K&M does offer machined aluminum however, if you are counting ounces. While the two units are different in design their end purpose is to keep matches safe and dry, both units were successful in this. So the details and features are really what set the two apart. The K&M has the compass, the Exotac floats, the K&M has a non-threaded cap and double o-rings, the Exotac is threaded and uses one 0-ring. Ultimately I suppose it comes down to which of those features you find important. 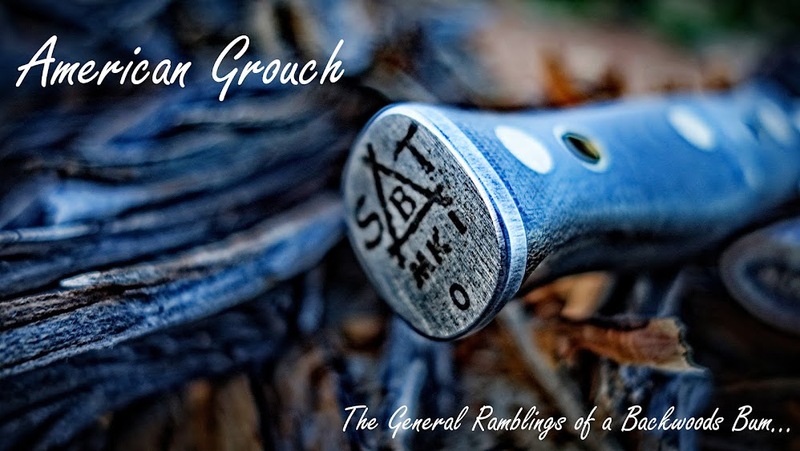 For me I'll keep carrying the Exotac as it floats and I consider that a pretty big plus, it has a larger capacity and I already carry multiple compasses and so don't need another. The K&M still isn't a bad choice if you want the compass feature and the classic styling. nice review. i have had an exotac for a while now, year +. never had wet matches. but the rough striker on the bottom always falls off mine. not a big deal as the strike anywhere matches strike off the texture, or off each other, or well, almost anywhere. it is a handy little case for sure. 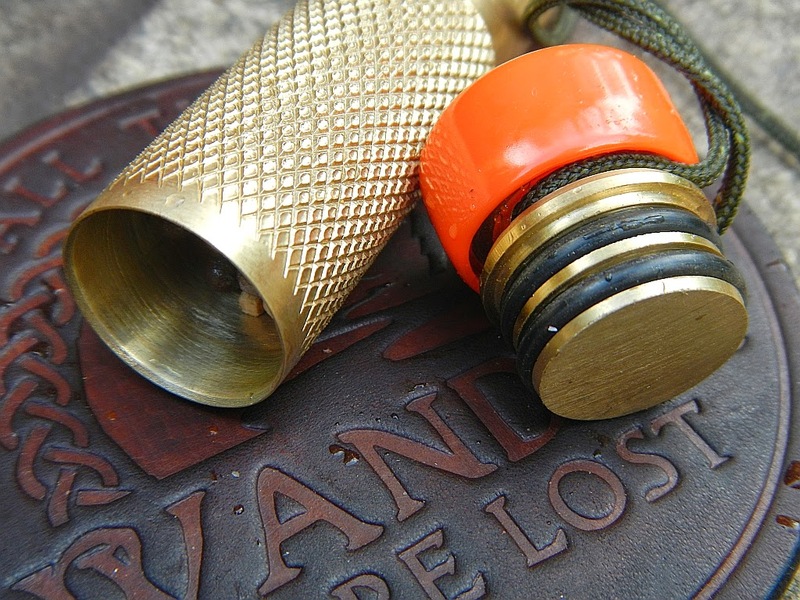 the old school brass one looks cool, but dont see it replacing a lighter one that floats. We think the same, I like the K&M but I'll continue to carry the Exo for sure. An excellent review. I need to upgrade my match cases and can see a use for both of these. Thanks for the review. I like both for different purposes. 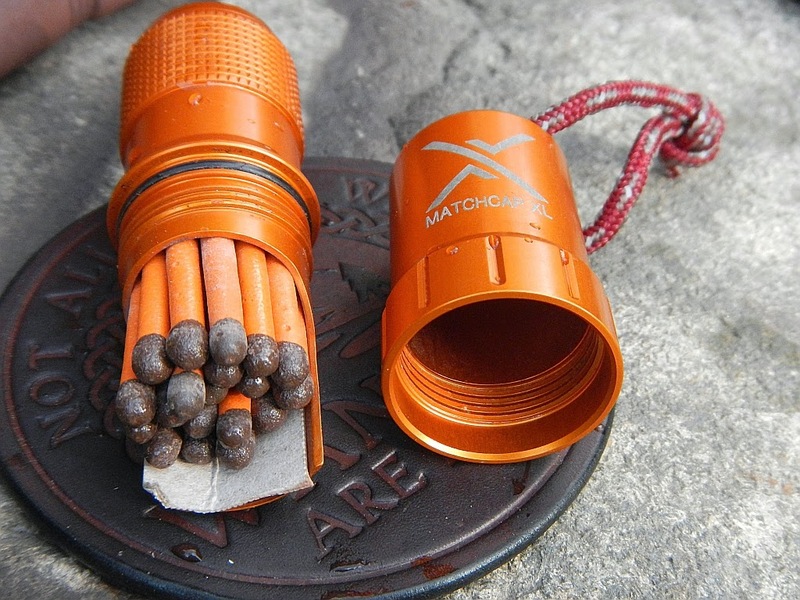 The Exotac is the best for UCO\REI matches for emergency use. 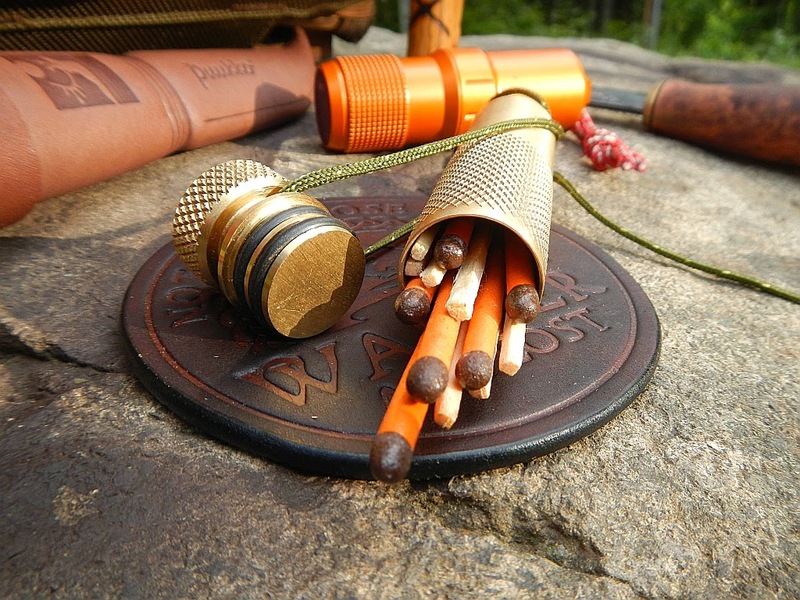 The K&M is better for strike anywhere matches and regular use. Even though the threads on the Exotac are more open they can still get water or dirt in them if they are opened regularly. They are protected if you don't open them in the field. I also have one K&M that I removed the compass and store tinder in the cavity, covered by the cap. I love reading reviews from rich guys. You never bother with petty details like prices. If only us poor working folk could see the world from your height. I don't typically post prices because they change. If I'm rich I sure as hell didn't get the memo. I work 60 hours a week shitbird, mayhap you should actually know something before you pop your lefty mouth off. Its a damn review. Who cares what the price is. Point was to compare what basically is the best 2 match cases on the market. GREAT REVIEW. Personally I like the old styling of the K&M but thats just me. PS I work 84-91 hrs in a row (welcome to medicine), not rich by any stretch of the imagination. The brass one sinks, the aluminum one doesn't. No surprise there. K&M makes/offers match cases out of both metals. Probably should have been noted in the review.